Hollybeary Creations : Think Spring!! Happy Tuesday everyone.. I hope you are all having a great start to the week. 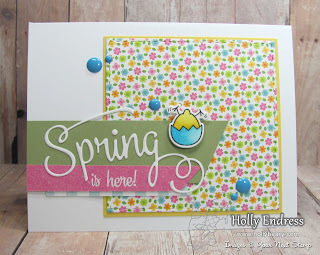 It's time for our Monthly Feature at Your Next Stamp and this month it's all about Spring. I'm using the new set Hey Chickie and the Coordinating dies and a new Challenge started Friday so I used the sketch as well. 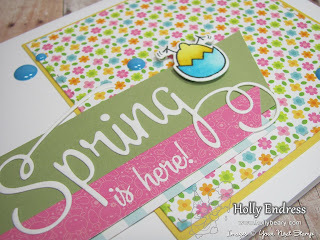 I created a White card base and then I added a piece of Pattern paper from Doodlebug that I die cut with the Stitched Squares die and I matted it in a piece of Daffodil Delight card stock. I created some Banners using a piece of Green card stock in my scraps and some additional coordinating Doodlebug paper. I die cut the Spring from the coordinating Dies and I heat embossed the sentiment in White. I added some Clear Wink of Stella to "Spring" but it's hard to see in the photo. I stamped one of the chicks onto some White card stock and colored it in with Copics and die cut with the dies as well. I adhered it to the banner with a dimensional. I wanted to bring in some more blue so I added a few of the Mermaid Fun gumdrops. 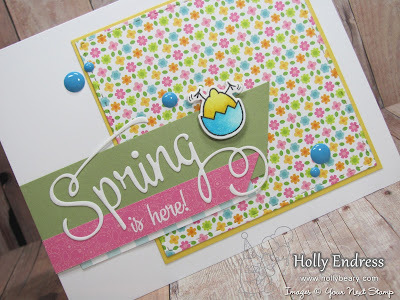 Head over to the YNS Blog for more fun Spring projects and a Chance to Win a Set of your choice!